I've been doing a lot of list building and theory-hammering lately in an effort to narrow down what my "tournament" list will be. I can't wait to play test the latest one that's got me caught up on bikes (I'll get it typed up and posted this week). I'm working on converting a new HQ choice, a Raven Guard Captain on Bike which allows bike squads of 5 or more to be taken as Troops instead of Fast Attack slots. I love the idea of ultra mobile, objective capturing bikes, especially for Raven Guard. 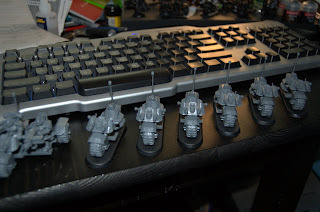 But I'm ashamed to say I've had this Ravenwing kit for over a year and hadn't assembled any of the models. The extra motivation that came with building lists which included a couple bike squads as troops gave me the push I was looking for to finally get this box together. The Landspeeder is taking a little longer than the bikes because it refuses to go together without green stuffing the gaps. I guess I let this one sit too long, much like the dreaded Drop Pods which have a tendency to warp and not go together nicely. I'm going to outfit this speeder with a Typhoon missile launcher and heavy bolter. I've also got a Landspeeder Storm on the horizon, and really hoping that model goes together smoothly as it looks amazing. It will play a vital role in the list as a late game objective grabber. Might even try running two, we'll see. I took a little break from painting to get some assembly finished and to get some more stuff primed. 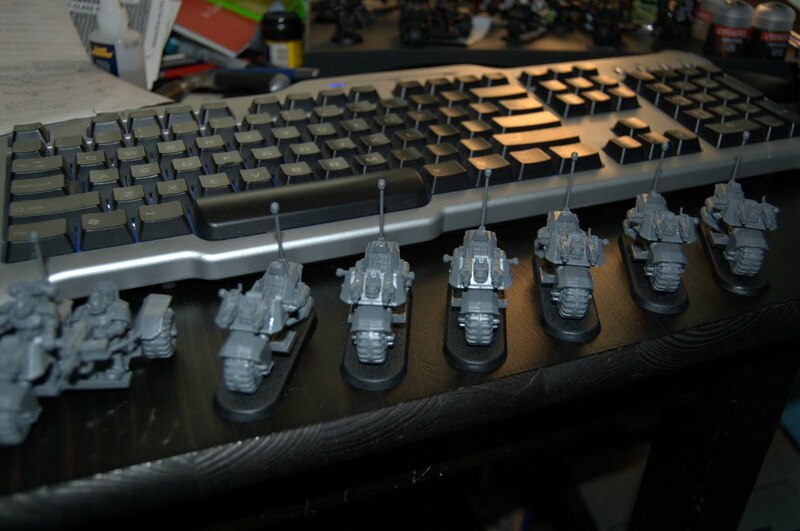 Will hopefully have some time this weekend to get back to painting the Venerable and Ironclad dreadnoughts.